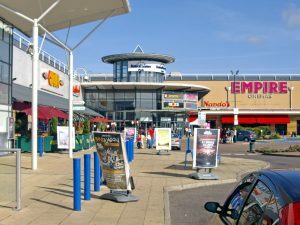 Festival Leisure Park, an entertainment leisure park in Basildon, Essex, has bridged the gap between its existing analogue CCTV system and a forthcoming IP installation, with the installation of 360 Vision Technology’s innovative Predator Hybrid camera. The expansive Festival Leisure Park attracts thousands of visitors each week, with a diverse client base from families and teenagers, to adults enjoying a meal, film, or after hours drinks at the park’s bars and nightclub. Festival Leisure Park management’s main priority is to ensure that all visitors enjoy their stay in complete safety. A corner stone of that strategy is a team of manned guards and supporting them; a purpose built security office, which houses the site’s CCTV system control desk. Over the life of its operation, due to architectural changes and some new building additions at the park, blind spots had emerged in the surveillance system’s coverage of the site. These surveillance gaps meant that if an incident occurred in a particular area, surveillance monitoring would miss incidents and intervention would not be possible, making any subsequent prosecution difficult to progress due to a lack of available visual evidence. Considering the issue, the park’s management turned to Security Consultant, Tony Lloyd of Lloyd Asset Protection. Tony’s solution took into account that whichever camera was going to be used, it would need to fulfil dual roles. Initially, the camera would not only need to integrate into the existing analogue system, but also be readily included into a planned future IP systems upgrade too. With this in mind, Tony recommended 360 Vision Technology’s Predator all-in-one PTZ camera, that features ‘patent pending’ Hybrid technology. Lloyd Asset Protection also specified a white light LED option for the Hybrid camera, which was to be installed to provide coverage for the rear exit of the park’s nightclub. Many years of CCTV experience led Tony to specify the switchable visible light option, in part, to help diffuse any incidents before they develop further. This theory has proven invaluable, as since the installation of the new camera, security staff at Festival Leisure Park report that not only can they now see and record high quality images from the rear of the nightclub building day or night, but that switching on the camera’s white light informs people that their actions are being watched and recorded – instantly changing their behavior for the better. Such is the quality of the new camera’s images, that Festival Leisure Park management are now considering an additional Predator Hybrid camera to perform the same role at the front of the night club – further enhancing system coverage.